Personal Locator Beacon in Contiguous U.S.
From: "Carl J. Skalak. Jr"
I just wanted to let you know that my rescue last week (10/14/03) from the Adirondack wilderness was a direct result of the existence of your web site, Equipped To Survive and the valuable information you make available. A month ago I didn't know what a PLB was. Your story about the recently approved 406 MHz Personal Locator Beacons, the link to the NOAA registration page and your candid reviews gave me the information I needed to make the decision to purchase one for my solo canoe trip into a remote section of the Adirondack State Park. When I became stranded by the severe blizzard conditions and the suddenly frozen river I used the PLB to call for assistance. I can't say enough about the SAR folks who came after me, but thanks in part to your efforts too, my heirs will have to wait a bit longer for their inheritances. Keep up the good work. Second Save, Same As The First? Not Quite! Click for more details. Skalak reflected, "If you get into a situation where self-rescue is dangerous or impossible, what are the alternatives? Somebody has got to come for you." Skalak said that the weather forecasts prior to departing on this trip provided no clue that such a strong storm would sweep through the area. Caught out by surprise, he was weathered in for three days of high winds and heavy rain which eventually turned to heavy snow. Friday dawned bright and sunny with the river, his means of transportation, frozen over and high drifts of heavy snow surrounding him. At this point Skalak faced a difficult decision. He still had 3 gallons of potable water, and the river close by, 3 or 4 sandwiches, some dehydrated rice dishes and a half gallon of fuel for his one-burner stove. However, he had no idea when the river would thaw, allowing him to paddle out. "I didn't feel like I was in dire straits. I just knew I couldn't get out on my own, and didn't know if that situation would change for the positive anytime soon," Moreover, he recognized that if he waited and the weather got worse again "or something happened like a tree branch falling on his tent," not only could he quickly find himself truly in trouble and not able to help himself or rescuers rescue him, but "instead of bright sunny sky, rescuers would be asked to come get me when the weather turned, presenting a greater danger to them." He made the rational decision to call for help while circumstances provided the best chance of a successful rescue at the least risk to others. When the beacon alert came in, center officials notified the appropriate state emergency rescue agency, said Lt. Col. Scott Morgan, the center's commander. In this case, the Herkimer County (N.Y.) Sheriff's Department worked with the center and provided information to the U.S. Forest Service at Watson East Triangle. "The center has many resources available to dispatch on a moment's notice to aid in search-and-rescue efforts," Morgan said. "The beacons help pinpoint the location of a person in distress." Because of heavy snows, forest service rangers were unable to reach Skalak's campsite and requested flight assistance. The rescue center scrambled the Fort Drum Air Ambulance Detachment, which launched a UH-1 Huey helicopter and medical team to assist in the search effort. Upon arriving on scene, 7 hours after the initial alert was received, the rescue crew received a flashlight signal from Skalak who was then airlifted to Fort Drum for medical evaluation before being released. "A thank you doesn't even begin to cover my appreciation," Skalak said. "I am profoundly thankful for all those who were willing to put themselves in harm's way on my behalf. Many terrific people worked together to make this mission a success." Prior to July, PLBs had only been available for use in Alaska under a test program conducted since 1994 that has about 400 persons saved to its credit with 378 PLBs registered (many are rentals/loaners used by multiple persons). The success seen in Alaska paved the way for the technology to be used throughout the rest of the nation. 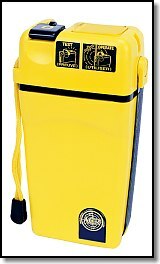 A PLB is a pocket-sized emergency beacon, a scaled down version of the EPIRB (Emergency Position Indicating Radio Beacon) and ELT (Emergency Locator Transmitter) that boaters and pilots, respectively, have had available to them for years. The most easily notable differences are size and cost. PLBs will fit in a pocket, weigh in at about a pound or so and they sell for prices starting below $500 (street price). UPDATE December 5, 2003: Two weeks later Skalak went back, alone, to retrieve his equipment left there when he was rescued. Officials were apparently less than pleased when he again set off his PLB on December 2. He was again rescued by helicopter, but this time in much more severe weather conditions. It was later determined that Skalak should have been able to make it out on his own and officials believe he had exaggerated his predicament. He was arrested, charged with making a false report and posted $10,000.00 bail. Skalak is scheduled for a court appearance in the town of Webb, New York, on January 20, 2004. Personal Locator Beacons, also known as PLBs, are finally here and everyone seems to have questions. We've got your answers with the most complete FAQ on PLBs you will find anywhere. Everything you always wanted to know about Personal Locator Beacons (PLBs), including some answers to question you maybe didn't even know to ask. PLBs send out digital distress signals on the 406-megahertz frequency, which are detected by the NOAA Geostationary Operational Environmental Satellites (GOES) and Polar-orbiting Operational Environmental Satellites (POES). GOES, the first to detect a beacon's distress signal, hover in a fixed orbit above Earth and receive the signals, which contain registration information about the beacon and its owner. The POES constantly circle the globe, enabling them to capture and accurately locate the alerts to within a few miles. The satellites are part of the worldwide satellite search and rescue system called, COSPAS-SARSAT. The COSPAS-SARSAT system is a cluster of NOAA and Russian satellites that work together to detect distress signals anywhere in the world transmitted from PLBs and from beacons carried aboard ships and airplanes. The Air Force Rescue Coordination Center acts as the single federal agency for coordinating search and rescue missions in the inland regions of the 48 contiguous states. PLB alerts from a marine environment are coordinated by U.S. Coast Guard rescue coordination centers. Click here for more information on Personal Locator Beacons (PLBs) on Equipped To Survive. Click here for more information on the COSPAS-SARSAT system and how it works. Click here to find out more about NOAA's online 406 MHz beacon registration.